Open to the public from 8:30 a.m. to 4:30 p.m., Monday through Friday. The office is closed from 12:00 p.m. to 1:00 p.m. daily for lunch. The Morgan County District Attorney’s Office observes all official county holidays. 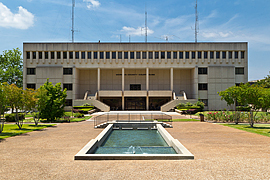 The offices of the District Attorney are on the 5th floor of the Morgan County Courthouse located at 302 Lee Street Northeast, Decatur, Alabama. Please do not contact the District Attorney’s Office to report a crime. If you are in need of emergency law enforcement assistance in the Morgan County area, help can be obtained by dialing 911 on your telephone. Crimes should be reported directly to local law enforcement agencies to ensure that they are properly investigated. In misdemeanor cases, after an incident report has been taken by a law enforcement agency, the victim will normally be required to make his or her complaint to a magistrate before a warrant can be issued. General legal advice cannot be given by the District Attorney. By Alabama law, the District Attorney’s Office is prohibited from giving legal advice to the general public. Legal consultation with the District Attorney is limited to victims and witnesses who are involved in criminal cases pending in Morgan County. For their own protection, criminal defendants are strongly advised not to contact the District Attorney’s Office, except through counsel.